The author is currently supported by BBSRC funding in the United Kingdom (WMNI P33458). Dendritic cells are the most potent, professional antigen-presenting cells in the body; following antigen presentation they control the type (proinflammatory/regulatory) of immune response that will take place, as well as its location. Given their high plasticity and maturation ability in response to local danger signals derived from innate immunity, dendritic cells are key actors in the connection between innate immunity and adaptive immunity responses. In the gut dendritic cells control immune tolerance mechanisms against food and/or commensal flora antigens, and are also capable of initiating an active immune response in the presence of invading pathogens. Dendritic cells are thus highly efficient in controlling the delicate balance between tolerance and immunity in an environment so rich in antigens as the gut, and any factor involving these cells may impact their function, ultimately leading to the development of bowel conditions such as celiac disease or inflammatory bowel disease. In this review we shall summarize our understanding of human intestinal dendritic cells, their ability to express and induce migration markers, the various environmental factors modulating their properties, their subsets in the gut, and the problems entailed by their study, including identification strategies, differences between humans and murine models, and phenotypical variations along the gastrointestinal tract. Key words: Dendritic cells. Human intestine. Celiac disease. Inflammatory bowel disease. Mucosal immunology. Migration markers. Las células dendríticas son las células profesionales presentadoras de antígenos más potentes que existen y, tras realizar la presentación antigénica, controlan el tipo de respuesta inmune que se establecerá (proinflamatoria/reguladora), así como su localización. Debido a su gran plasticidad y capacidad de maduración en respuesta a señales de peligro locales derivadas de la inmunidad innata, las células dendríticas son un elemento clave en la conexión entre la inmunidad innata y las respuestas de la inmunidad adaptativa. En el intestino, las células dendríticas controlan los mecanismos de la tolerancia inmunológica frente a los antígenos de la dieta y/o la flora comensal, a la vez que son capaces de iniciar una respuesta inmunológica activa en presencia de un patógeno invasor. Las células dendríticas son pues muy eficientes en controlar el delicado balance entre tolerancia/inmunidad en un ambiente tan cargado de antígenos como es el intestino, y cualquier factor que las afecte puede tener repercusiones en su funcionalidad, pudiendo en última instancia desarrollarse patologías intestinales como la enfermedad celiaca o las enfermedades inflamatorias intestinales. En esta revisión sintetizaremos nuestro conocimiento de las células dendríticas del intestino humano, su capacidad para expresar e inducir marcadores de migración, los diversos factores ambientales que modulan sus propiedades, los diferentes subtipos de células dendríticas que nos encontramos en el intestino y los problemas derivados de su estudio incluyendo sus diferentes estrategias de identificación, las diferencias entre humanos y modelos murinos y sus variaciones fenotípicas a lo largo del tracto gastrointestinal. Palabras clave: Células dendríticas. Intestino humano. Enfermedad celiaca, Enfermedad inflamatoria intestinal. Inmunología mucosas. Marcadores de migración. Dendritic cells (DCs) are the most potent antigen-presenting cells (APCs) in the body. In contrast to other APCs such as B-lymphocytes or macrophages, DCs are unique in that they can initiate a primary immune response by stimulating naïve T-cells, and control the development of a tolerogenic or proinflammatory immune response (1-6). DC precursors migrate from the bone marrow to virtually all tissues in the body, including the bowel mucosa. Once in their destination immature, sessile cells are highly efficient in antigen capturing and processing, which allows them to sample their environment (7,8). In addition to their role as sentinels DCs also act as immune system sensors given their high expression of pattern recognition receptors (PRRs), including Toll-like receptors (TLRs) (9-11), as well as their capacity to become activated in the presence of innate immune stress as mediated by cytokines and/or oxygen reactive species (12,13). DCs are therefore the nexus connecting innate (non-antigen specific) immune responses to the highly specialized adaptive immune responses. Once they have captured a "danger antigen" via their PRRs or sensed an immune stress signal DCs lose both sessility and their high antigen-processing capacity, and start migrating to secondary lymphoid organs in a CCR7-dependent manner (2,14). During migration DCs mature, which manifests as 3 primary changes or signals (15): The first signal is an increased surface expression of processed antigens aided by an increase in HLA molecules. The second signal is an increased expression of co-stimulating molecules such as CD80(B7.1) /CD86(B7.2) (T-cell CD28/CTLA4 ligands) or CD40 (T-cell CD40L ligand). The third signal involves a change in cytokine production that alters the balance between proinflammatory and regulatory cytokines (1-6,15). Once in the secondary lymphoid tissues DCs will have lost their antigen-capturing ability but will be extremely efficient for antigen presentation and in stimulating T-cells, true effectors of immune response. The eventual combination of these 3 antigen presentation signals in terms of intensity and quality will determine the type of immune response (proinflammarory/regulatory) lymphocytes will adopt. In addition to controlling the type of immune response (proinflammatory/regulatory) that is established against each specific antigen, DCs also control its location (16). Prior to stimulation näive T-cells express migration markers that lead them to lymphoid tissues (17). Once there, during antigen presentation, DCs deliver a fourth signal and induce the expression of homing markers or migration markers. Specifically, DCs induce in effector lymphocytes homing markers that will lead them to the target tissues where antigens they were trained to recognize are to be found (18-21), this being the reason why immune responses occur following a tissue-specific rather than a systemic approach. The mechanisms through which DCs may induce homing markers in effector cells are just beginning to be elucidated, and seem to involve -among other components- fat-soluble vitamins such as vitamin A and vitamin D. The 25-OHD molecule, that may be generated in the skin following the ultraviolet light-dependent activation of vitamin D, induces the expression of skin-homing markers in T-cells (22). In turn, gut DCs possess the enzymatic machinery necessary to synthesize retinoic acid (RA), a metabolite of dietary vitamin A that induces gut-homing marker expression in T-cells (23). However, as we shall discuss below, RA not only controls the intestinal migration capabilities of effector lymphocytes but is also involved in a host of other intestinal immunity mechanisms (24). 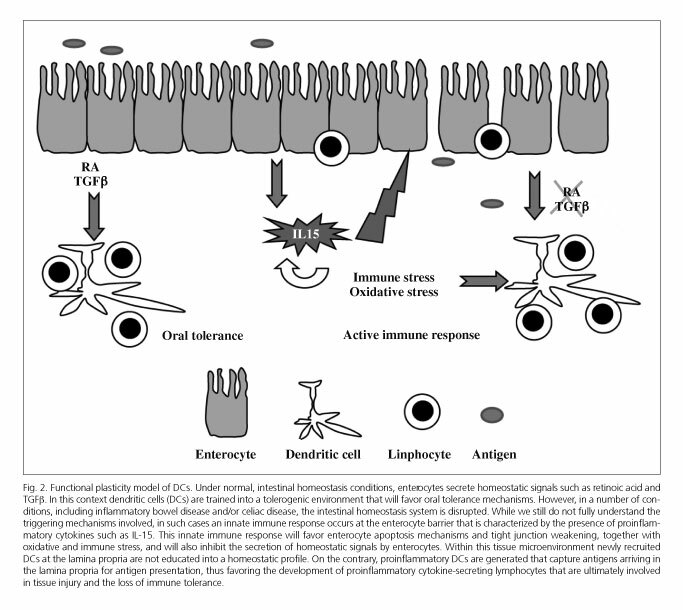 While the systemic immune system favors the development of an active immune response against foreign antigens, the mucosal immune system operates the other way round; in an environment so rich in antigens like the gut, the intestinal immune system by default gives priority to immune tolerance mechanisms (25) regarding the commensal flora and food antigens (26). When the immunity-tolerance balance is altered, the immune system may take it wrong and establish an abnormal immune response against the commensal flora and/or dietary antigens, as is the case, respectively, in inflammatory bowel disease (IBD) (27) and celiac disease (CeD) (28). Intestinal DCs are key cells for the control of immune tolerance mechanisms in an environment so rich in antigens like the gut (29,30). Under normal conditions, in the absence of inflammation, DCs have a regulatory role and prevent the development of immune responses against food antigens and/or the commensal flora (29,31). The lower immunogenic capacity of intestinal DCs results from a number of factors. One of them is that they exhibit a decreased expression of PRRs such as TLRs (30), which grants them a lower capability to identify commensal bacteria in an environment that is loaded with bacterial antigens. In addition, the second signal of antigen presentation is decreased in intestinal DCs because of a reduced expression of co-stimulating molecules in their surface and an increased phagocytic capacity as compared to DCs in other organs (32,33). Finally, the third signal of antigen presentation also tends towards a higher production of regulatory cytokines, including IL-10, rather than pro-inflammatory cytokines such as IL-6 or IL-12 (30). Under these conditions human intestinal DCs have a reduced stimulating capacity when compared to those in other tissues (21), which is key in maintaining tolerance mechanisms and in preventing inflammatory processes in the absence of invading pathogens (30,34,35). In addition to reduced stimulating capacity intestinal DCs also play an active role in aiding mucosal tolerance by favoring the differentiation of antigen-specific regulatory T-cells and IgA-secreting B-cells (36-42). Last, DCs induce the expression of gut-homing markers (α4β7 and/or CCR9) both in IgA-secretory B-cells and regulatory T cells (40,44-46), which is key in keeping immune tolerance processes confined in the gut. The relevance of DCs for the control of immune tolerance becomes particularly clear in IBD, where DCs accumulate in the colon (47). Furthermore, these DCs have high levels of co-stimulating molecules and a greater capability to secrete pro-inflammatory cytokines, hence they favor the development of pro-inflammatory T-cells rather than regulatory lymphocytes (48), thus leading to inflammation and loss of immune tolerance towards the commensal flora. T-cells migrating to the gut express the α4β7 heterodimer on their surface (49) since its ligand, the MAdCAM-1 molecule, is expressed by endothelial cells in the lamina propria postcapillary venules of both the small and large bowels (50-52). Another molecule controlling migration to gut tissues is chemokine receptor CCR9. Its ligand, molecule CCL25/TECK, is expressed by small-bowel epithelial cells (53-55) with a gradient -expression is maximal at the proximal end and gradually decreases in the ileum to become undetectable in the colon (56). However, molecules managing this ìimmunological zip codeî do not seem to only control migration target tissues but also migrating cell types, since monocytes, T-cells and B-cells have been shown to use differential homing markers even when migrating to the same tissue (57,58). These differential mechanisms in the various WBC populations might allow a functional specialization of immune responses in the different segments of the gastrointestinal tract. The expression of migration markers on T-cells, as well as that of their tissue ligands, keeps immune responses at a local level. In IBD [ulcerative colitis (UC) and Crohn's disease (CrD)] and CeD MAdCAM-1 expression is increased in the intestinal lamina propria (59-62). This is reflected by a redistribution of circulating β7+ T-cells from peripheral blood to intestinal compartments, hence in the lamina propria of these patients a high density of T-cells with increased proinflammatory cytokine secretion may be found. On the other hand, in patients with CrD, DCs located in the mesenteric lymph nodes have the ability to prioritize responding lymphocytes with CCR9 (65). In these same patients an increased expression of the CCL25/TECK ligand in the small bowel (but not in the colon) has been reported, which allows proinflammatory CCR9+ T-cell recruitment in the lamina propria (66-67). Albeit the expression of migration markers and their ligands helps understand the basics of immune responses (tolerogenic/proinflammatory) in the gut, there is evidence to believe these molecules are also responsible for the development of extraintestinal manifestations in IBD. An example may be found in the γδ T-cell population, particularly important for intestinal immunity mechanisms (68-70). Under normal conditions in the absence of inflammation, circulating γδ T-cells exhibit a migration pattern that is confined to the gut and characterized by the expression of integrin β7 on their surface and absence of CLA, a molecule that controls migration to skin tissues (71). However, in patients with IBD and extraintestinal manifestations such as erythema nodosum there is an aberrant γδ T-population with a β7-CLA+ profile that disappears when patients receive steroids and improve clinically (71). In patients with UC who develop primary sclerosing cholangitis following bile duct inflammation MAdCAM-1 and CCL25 expression has been seen not to be confined to the gut, and these molecules may in contrast be identified in the liver of these patients (72). Finally, some patients with CrD develop paradoxical extraintestinal inflammation following immunosuppressive therapy with anti-TNF antibodies (73). A recent study has shown that in vitro cultures of peripheral blood mononuclear cells in the presence of infliximab (an anti-TNFα monoclonal antibody) induce changes in the expression of T-cell migration markers (74) that might be involved in the development of the aforementioned paradoxical inflammation. While the study of migration markers has usually been limited to lymphocyte populations, APCs such as DCs also express migration markers that vary according to tissue (21); as with lymphocytes, diseases seem to induce changes in their migration markers. In patients with active IBD, increased intestinal CCL25/ TECK expression (66,67) seems also involved in an increased recruitment of circulating monocytes, which in turn exhibit an increased expression of CCR9 (75). On the other hand, patients with CrD restricted to a number of tissues (small-bowel/large-bowel) show an altered expression of migration markers β7, CLA and CCR9 on peripheral blood DCs that is correlated with the involved tissue, which again suggests a higher infiltration of DCs in target tissues (76). These changes in migration markers involving circulating populations may therefore be useful as novel diagnostic tools using less invasive approaches or as new therapy targets (16), as will be discussed below. Given the importance of migration markers, these have revealed themselves as highly interesting therapeutic targets in intestinal diseases (77,78). Natalizumab, a humanized monoclonal antibody against integrin α4, has proven its ability to induce and sustain clinical remission in patients with CrD by blocking heterodimer α4β7, the molecule responsible for controlling migration towards the bowel (79,80). However, this therapy might have side effects arising from the fact that migration markers are redundant and different combinations of chemokine receptors and integrins control migration to various tissues in the human body (16,21). Even though its role is poorly understood in non-inflammation settings, integrin heterodimer α4β1 (VLA-4) regulates lymphocyte passage into the central nervous system (following their interaction with the VCAM adhesion molecule expressed by endothelial cells in inflamed tissues (81). Thus, natalizumab (anti-4) has also proven effective for the treatment of patients with multiple sclerosis (82). Due to code redundance and the fact that different tissues (intestine-brain) partly share their homing markers (integrin α4), some patients with CrD or multiple sclerosis who were treated with natalizumab developed a progressive multifocal leukoencephalopathy because of reactivated latent infection with polyomavirus JC. It may therefore be that inhibiting constitutive lymphocyte traffic to target tissues (presently the brain) may eventually impact systemic immune surveillance, which in the present case allows the development of latent infection (83,84). In view of the existing code redundance a new generation of monoclonal antibodies against heterodimer 47 has come to light (85), and some have proven efficient for the treatment of patients with IBD, apparently with no systemic immune suppression (86). However, as seen above regarding polyomavirus JC reactivation, these immunosuppressive strategies are not exempt from certain risks that cannot be predicted beforehand. Intestinal DCs have a number of unique immune particulars allowing them to control immune tolerance processes against food and/or commensal flora antigens (46,87-90). Therefore, one may wonder whether such DCs belong to a separate lineage, one set apart from DCs in other bodily tissues. Recent studies have suggested that at least 2 DC subpopulations exist in the intestinal lamina propria, with different characteristics and migration markers. 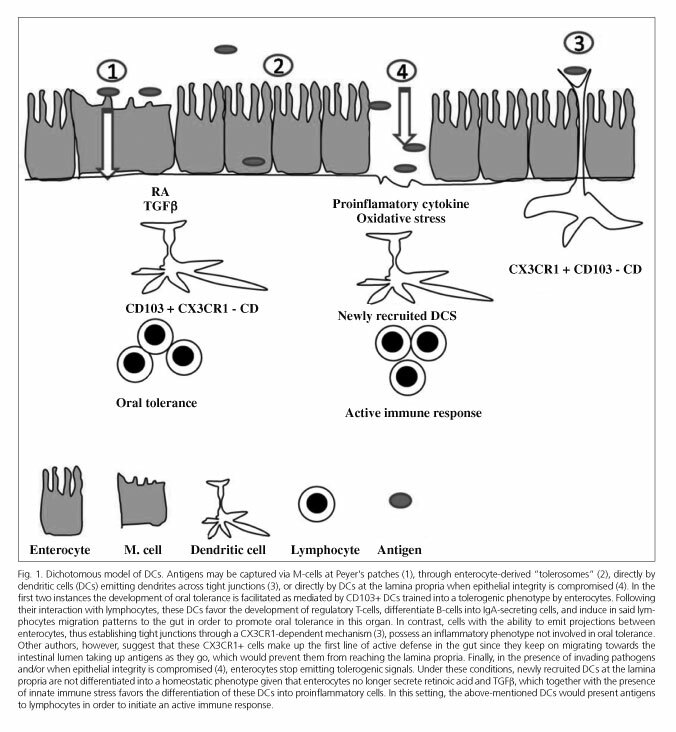 Intestinal DCs may then be classified into tolerogenic DCs (CD103+, CCR7+ and CX3CR1-) and proinflammatory DCs (CD103, CCR7- and CX3CR1+), which control tolerance mechanisms versus food and commensal flora antigens, and trigger immune responses against invading pathogens, respectively (91-93) (Fig. 1). Furthermore, tolerogenic DCs possess the enzymatic machinery (enzyme RALDH2) necessary for vitamin A metabolism and RA generation (Table I). Under basal conditions in the absence of inflammation, DCs newly arrived in the intestine are educated by the tissue microenvironment in order to acquire a regulatory phenotype against non-pathogenic antigens. Conversely, in the presence of a proinflammatory process and/or danger signals these facilitate an "in situ" differentiation of monocytes into proinflammatory DCs (91-94). Such dichotomy should allow to explain the ability of new intestinal DCs to distinguish invading pathogens in a "danger" setting while maintaining commensal flora and nutrient tolerance, which is mediated by DCs extravasated during non-inflammatory processes and having acquired a regulatory phenotype (95). While this hypothesis is primarily based upon information obtained from murine models, CD103+ cells in human mesenteric lymph nodes share several characteristics with murine DCs, which has been the grounds for the 2 DC populations model (65,96). Indeed, CD103+ DCs in the human small bowel are decreased in CeD (97), whereas in patients with diabetes mellitus type 1 they fail to generate regulatory-phenotype T-cells as opposed to healthy controls (98). However, evidence is larger against this dichotomous model. Although a majority of DCs in the human intestinal lamina propria have a regulatory profile (21,30,33), this is not restricted to the CD103+ population (Table I), which is minoritarian in the human gut (99). Similarly, DCs in the human colonic lamina propria do not express CCR7 (100), which according to this dichotomous model would suggest a proinflammatory role (Table I). However, CX3CR1 (a molecule traditionally associated with proinflammatory DCs in the bowel) is virtually absent in human colonic DCs (99). Therefore, the model including regulatory CD103+ cells and proinflammatory CX3CR1+ cells is seemingly an oversimplification. New evidence suggests that the CX3CR1 population does not include DCs proper but macrophages (99), which in contrast to traditional considerations would indeed have the ability to migrate to lymph nodes for antigen presentation (101,102). On the other hand, other authors have suggested that the role of the CX3CR1 antigen-presenting cell, whether DCs or macrophages, would be associated with a passive tolerance model regarding invading pathogens. These cells would have the ability to migrate towards the lumen in the presence of infection while becoming loaded with bacterial antigens, thus limiting their potential to access the lamina propria and, therefore, maintaining tolerance (103,104). In summary, it looks like the dichotomous model of DCs in the human bowel is an oversimplification derived from limitations in the study of these cells, as will be discussed below. New evidence indicates that it is the tissue microenvironment itself that conditions DC phenotype, inducing a regulatory profile on their leaving the blood stream and reaching the gut. DCs in different tissues express different migration markers (21), which are dynamic structures modulated by the microenvironment in which DCs abide (21,105), thus giving proof of DC plasticity. This flexibility on the part of DCs seems to extend to other traits, including their ability to polarize different Th1, Th2 or Treg immune responses depending on their prior exposure to various cytokines and/or microbiota-derived signals (106). In this way, following their conditioning by the local microenvironment, DCs acquire the migration markers corresponding to the tissue they are in, and also the ability to imprint them on responding lymphocytes, thus modulating immune responses by sending effector cells back to the target tissue where the antigen is to be found (18,21,107). In the absence of inflammation, intestinal DCs acquire a regulatory profile following exposure to various ìsedativeî signals secreted by lymphocytes (93,96,108-110) (Fig. 2), including thymic stromal lymphopoietin (TSLP), a number of regulatory cytokines such as TGF-β or IL-10 (40,44,93,96,111,112), and most particularly RA. RA is the active form of vitamin A and is a key factor in the development of immune tolerance. In the presence of RA DCs acquire the ability to generate regulatory T-cells and IgA-secreting B-cells, as well as to induce a gut-homing pattern (40,44-46,88,113). RA is therefore essential for intestinal immune tolerance mechanisms, and it is precisely intestinal DCs (but no DCs in other tissues) that possess the enzymatic machinery necessary to convert vitamin A into RA (65,114,115). The intestinal immune system is, however, dynamic -in the presence of a danger signal its regulatory profile disappears as enterocytes stop secreting ìsedativeî signals. This is partly due to the fact that enterocytes themselves have in turn the ability to recognize the presence of invading bacteria. Enterocytes are programmed to secrete TGF-β and RA on recognizing bacteria in their apical membrane by means of their PRRs; however, in the presence of invading bacteria through tight junctions, these germs are recognized by the PRRs located on the basolateral membrane of enterocytes (116-119). In this setting, enterocytes block the secretion of inhibitory signals and consequently DC "sedation". Furthermore, the presence of an innate immune response against invading bacteria involves the secretion of different proinflammatory cytokines and/or oxygen reactive species with the ability to induce DC maturation (12,13). Under such conditions, DCs now recognize and capture antigens as invading pathogens, and block immune tolerance mechanisms to favor those of an active immune response (Fig. 2). This capacity of DCs to rapidly and efficiently respond to their microenvironment grants them the ability to control the immune system and the balance between immunity and tolerance mechanisms. Despite its huge relevance for the control of immune response type and localization both under normal conditions and during inflammatory processes such as CeD or IBD (21,30,33,63,64,120,121), the study of DCs is faced with many problems. This is due not only to their low numbers but also to other factors complicating their characterization, including: a) The different species used for their study; b) the identification strategy employed; and c) the studied compartment within the gut. Most of our current understanding of DCs was obtained from murine models. While immunity/tolerance mechanisms may be identical in humans and mice, signaling pathways and involved cell populations may vary considerably (122). An example may be found in the Tgd lymphocyte population in the intraepithelial compartment, which rarely exceeds 20 % in humans but represents up to 50 % in murine models (122,123). Similarly, molecule TLR4 is expressed by murine but not human B-cells (122), whereas FoxP3, seemingly a valid marker for the identification of regulatory T-cells in mice, plays an uncertain role in human beings (124). In addition, the benefits of the microbiota to the intestinal immune system are species-specific (125), and humans also differ from the various murine models in microbiota composition (122). 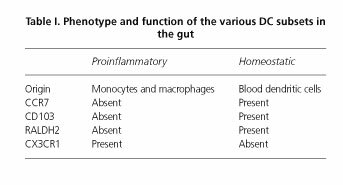 Intestinal DCs and macrophages share a number of both phenotypic and functional characteristics that render their correct classification challenging in the gut (126). Furthermore, multiple cell types have unique markers that facilitate identification (CD3+ for T-cells, CD14+ for monocytes, CD19+ for B-cells, etc. ), but no marker allowing to characterize DCs has been identified to date. DC characterization in tissue is usually performed by examining HLA-DR (or other HLA-II molecules) expression and then excluding different cell populations. However, here a new issue emerges since different laboratories use different markers to exclude DCs. In our laboratory we identify DCs as HLA-DR+ CD3- CD14- CD16- CD19- CD34- cells, but other laboratories exclude marker CD14 from their cocktail and/or add marker CD56. However, A DC population that is increased in the lamina propria of patients with UC has been recently characterized (127), which expresses marker CD56+. This population has not been described (as far as I know) in murine models, but evidence is being increasingly found in the literature focused on their characterization in humans (128-130), even though its role (if any) in the inflammation/tolerance mechanisms found within the gastrointestinal tract remains to be elucidated. The use of different identification strategies for DCs by the different research teams represents a challenge not only for characterization but also when comparing results. In an attempt to obviate this DC identification issue some authors forget the troublesome differentiation between macrophages and DCs, and alternatively focus on the study of tissue-related APCs, identified as leukocytes with a high expression of HLA-II molecules (97,120,131). These differences in characterization enable in turn the identification of apparent discrepancies in the literature. Di Sabatino et al. (121) recently identified a plasmacytoid DC subtype in the duodenal lamina propria of celiac subjects that represented a relevant source of IFNα and presumably was the origin of most DCs in the celiac lesion. However, other teams have identified no plasmacytoid DCs in the celiac duodenum (97,120,131). Such discrepancies may be accounted for by considering the differing DC identification strategies. Albeit Di Sabatino et al. (121) identified DCs as HLA-II+, lineage-negative cells, other authors insist on APC identification (97,120,131). One of the problems is that plasmacytoid DCs have a decreased expression of HLA-II molecules and so should not be included in the APC compartment because of their reduced HLA-II expression, even if they may be identified using classic DC identification strategies (author's unpublished data). A recent paper seems to point out that this distinct identification strategy is not the origin of the apparent conflict between laboratories (132), which adds a new complicating factor to the study of DCs deriving from sample processing and/or the protocol in use. Regarding which is the best identification strategy for APCs in the gut, the differences between DCs and macrophages, and the various DC subtypes, this author cannot unfortunately offer a clear answer and recommends an identification strategy according to the question posed, albeit with awareness that every identification approach has limitations, and surely no strategy is better than the next one, all of them being complementary ways to deal with one same problem. Most of our current knowledge on intestinal DCs was obtained from the large bowel. This organ is different from the small bowel, hence it is no wonder that DCs in these two compartments have different immune traits, including a differential expression of CCR7 (100) and different maturation levels (Mann, E.R., personal communication). Variations in DC phenotype may be found even within one single organ. The ascending colon and descending colon exhibit differences in blood supply, enzyme activities (133,134), and enterocyte gene expression (135). In fact, tumors involving both compartments have been traditionally considered differently (136), and new evidence has confirmed these are molecularly differentiated entities (137,138). These differences suggest, therefore, the presence of biological differences in the mucosas of both colonic compartments. To confirm this -even though CCR9 is considered a specific small bowel-homing marker, and indeed DCs in the human terminal ileum express said marker- colonic DCs also express the aforementioned marker (99) and there is a differential expression between the ascending and descending colon. In addition, DCs in both sub-compartments differ regarding the expression of molecules involved in bacterial antigen recognition, activation markers, migration markers, cytokine production, and ability to stimulate lymphocytes (manuscript in preparation). Therefore, presuming that DCs represent a single population along the intestinal tract is just another oversimplification, and we should bear in mind the tissue they were obtained from. Similarly, we should also consider the affected tissue when studying intestinal disorders, as DC properties -as well as those of the immune system in general- may vary among tissues. Thus, as is the case with colorectal cancer, which is not a consistent disorder (137,138), IBD may also vary according to involved tissues, and may thus require different treatments depending on its site. The study of DCs is key in understanding the mechanisms controlling immune responses in the gastrointestinal tract, both under normal conditions in the absence of inflammation and when immune tolerance is compromised. While the study of DCs is no easy task and multiple aspects render characterization difficult, new experimental evidence suggests that we are on the right path to unveiling their complexity and mechanisms of action. When we finally manage to fully decipher the mechanisms by which DCs control oral tolerance, we shall be in a position to understand why in selected conditions such as IBD and CdD the system malfunctions and puts up an immune response against harmless antigens. Above all, notwithstanding, we shall be in a position to develop tailored, tissue- or subtissue-specific therapies, thus obviating the systemic immune modulation problems usually associated with IBD.